The other evening the wife & I were watching the season finale of Burn Notice on our DVR. I thought it an apt metaphor for our current experience. The main character, Michael Weston, is a spy who is blacklisted and dumped in Miami. The show is about his quest to discover why he was blacklisted (false accusations), and how he helps people in need of his specialized skills on the way. 9 Be merciful to me, O LORD, for I am in distress; my eyes grow weak with sorrow, my soul and my body with grief. … 14 But I trust in you, O LORD; I say, “You are my God.” 15 My times are in your hands; deliver me from my enemies and from those who pursue me. 16 Let your face shine on your servant; save me in your unfailing love. 17 Let me not be put to shame, O LORD, for I have cried out to you; …19 (Ps. 31 NIV)How great is your goodness, which you have stored up for those who fear you, which you bestow in the sight of men on those who take refuge in you. I didn’t watch all of the MLB All-Star Game. CavWife wanted to watch In Plain Sight, one of the summer shows we watch. We discovered, much to our dismay, that our new DVR didn’t record the show Sunday night. The record light was on… so we are mystified. So we went to the USA website and watched it on-line. Our new, higher speed internet worked much better than our previous attempts to watch episodes of Burn Notice we missed. We upgraded to digital cable and higher speed internet to get the digital phone service. It was $1 more than with standard cable. We save about $50 over our combined internet/cable & Verizon bill. So it made sense to bundle it. While we watched the show- interrupted periodically by a child with issues- I kept my eye on the never-ending pre-game festivities. Since this was the final year of Yankee Stadium, they pulled out all the stops. Lots of Yankee hall of famers. Not to be outdone by the Red Sox extravaganza back in ’99, they trotted out a feeble King George. It was touching to see the warmth Yogi had for him. But I didn’t notice any of today’s players around the league embracing him like they did Ted Williams. But, I wasn’t engrossed so it could have happened. After the show, CavWife got ready for bed so I actually watched the game. When I went to bed, it looked like Matt “Trade Bait” Holliday might be the MVP for his solo shot. It was 2-0 and the AL was doing … nothing. I figured it was over and went to bed much in need of rest. As it turns out, the Papel-flap was a non-issue. Mariano Rivera did not get a chance to close the game. But his pitching was important as the AL came back to put the game into extra innings. The NL blew 2 save opportunities. And in a beautiful twist of fate, or irony, the oft-maligned J.D. Drew -in his first All-Star game- got the last laugh, belting a 2 run homerun and stealing a base to lead the AL to victory. 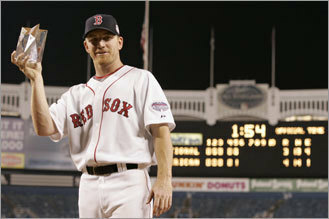 The Red Sox player won the MVP award. The controversy erupted on ESPN, again. The great part is they’ll give the Brett Favre story a rest. A few years ago the controversy was “how in the world can they have a tie in the All-Star game”. Now the controversy is “how could they make those guys who pitched Sunday pitch since the game went to 15 innnings.” Zzzzzzz. Didn’t their managers know they were going to the All-Star game? Did it shock them to realize they might have to actually pitch? Hello?! But I’m glad I didn’t try to watch this thing. I didn’t need to be up until 2 am. I am glad the AL gets homefield advantage again (I like that the games count! ), and that one of the Sox was a key player in the game. Great to see Pedroia and Youk in their first All-Star games. These guys are known for hustle and grit. They face every game and at bat as if it will be their last. They leave it all on the field. They will probably be in a few more of these games. We’ve been putting the kids on a chair in the living room to discipline them when they are having crying/screaming fits. CavSon was in rare form tonight, refusing to say “please” (he knows the sign for please). It was a battle of the wills, and he was screaming pretty loudly. It began when he wouldn’t ask for the seconds he wanted for dinner. Instead of signing ‘please’, he pitched a fit. After we took it to the chair he would not sign please to get down. I asked CavWife if we should look on EBay for a cone of silence like Maxwell Smart used to have. Of course, that didn’t work very well. I’m sure technology has improved since then. Anyway, he sat on that chair until bath time refusing to say “please”. I’d ask him and he’d shake his head. He is one stubborn cookie, and I’m in for trouble. At least it provides an apt sermon illustration for this Sunday. Maybe a pina colada IV would do the trick. I guess there might be some ethical/moral issues with that- but I’d certainly feel better in the short term. Update: Apparently they are releasing a new Get Smart movie this June starring Steve Carell and Anne Hathaway. A type of Get Smart Begins, as Max is just an analyst when all of Control’s agents are compromised. He is promoted to field agent under the guidance of the only agent whose identity is not compromised- Agent 99. Could be great, or it could really stink. 1. McNamee seemed more believable to me. He admitted to his lies to reporters, and the process by which he was essentially caught and had to tell the truth. Apparently Congressman Burton can’t understand the distinction between lying to reporters in 2005 and lying to Congress under oath in 2008. 2. Roger can’t answer a question to save his life, and he was in way over his head intellectually (which is surprising considering how dumb most of the Republicans looked). He couldn’t understand that 2 conversastions with McNamee about injecting his wife with HGH qualify as conversations about HGH with McNamee, which he repeatedly denied having earlier in his deposition. If my wife was having a reaction to an injection to HGH, I’d certainly call my doctor and study up on HGH fast. Yet, Roger claims he knows next to nothing about HGH. Mind boggling how goofy this guy comes across. Great pitcher, but the IQ of a turnip. He was caught in a number of inconsistencies, and offered no reasonable explanation for them. His abuse of the English language was comical. 3. Sadly this was politicized. By and large the Republicans went after McNamee. Souder, who was burned by Palmeiro in 2005, was the exception. I guess his autograph parade through the offices last week paid off (Souder again declined). The Democrats, who did look far more prepared than the Republicans, pretty much went after Clemens. Congressman Mica of Florida, aka Master of the Obvious, was doing his best Forrest Gump imitation, seeming entirely clueless. 4. Lost in the comedic caper, by most of the participants, was the testimony of Pettite & Knobloch. Hmmm, Andy increased the number of times he admits taking HGH. Why can’t McNamee remember more accurately over time? But in those instances McNamee told the truth. Why would he be lying with regard to Roger? Roger never explained that. Roger tried to throw Andy under the bus with his wife and agents by saying he “misremembered” Roger. Andy’s conversations with Roger show that Roger intended to lie (or had deceived himself). Could Roger come up with any compelling reason for Andy to say this? No. 5. The Nanny Gate aspect is interesting, though not conclusive. She does not remember a party, but did remember the whole family, including Roger, getting a tour of Jose’s home. She thinks that Roger played golf with Jose. This does not mean much regarding McNamee’s testimony, but the fact that Clemens himself met with her prior to her deposition is disconcerting. His lawyers? Yes, that would be normal. But Roger should not have been there- it could easily be considered intimidation. And intimidation is Roger’s bread and butter as a pitcher. This also seems to be the way he has gone about defending himself. I missed this part, but apparently Roger admitted he may have been at the party. Last night I caught the end of the Seinfeld episode where Jerry won’t admit to watching Melrose Place to a woman he was dating. He faced a lie detector test, since she was a policewoman and smelled a lie. He asked George how to beat the test. “If you believe it, (pregnant pause) it’s not a lie.” As I’ve said in other posts, I think Roger really believes he’s telling the truth, but he’s not. My post on Bond, Bourne & Bauer has been picked up, with some editing, by Gender Blog. It is put together by the Council for Biblical Manhood and Womanhood. Lend them some support, and me too! They do call me an “avid Red Sox fan”. Guilty as charged, though I need to see if this hinders me in the Great Race. I’m grateful for their affirmation. I taped our normal TV shows while CavWife was away. While the kids have slept, we’ve been catching up. Tonight was a recent Law & Order. 3 guys, apparent murder suicide: one was gay, his roommate straight, and the killer a veteran sleeping of the couch. This “ripped from the headlines” was ripped from Orlando’s headlines and was a fictionalized account of my friend David Abrami’s murder. I felt sick. Turning this tragedy into a story that some posters on the Orlando Sentinel made up- they were really killed by either one of Ralph’s contacts in the Republican Party or one of Dave’s former clients. I’m just stunned. It really is different when one of those stories that is spun off from a crime involves someone you knew.